Love steak fajitas? 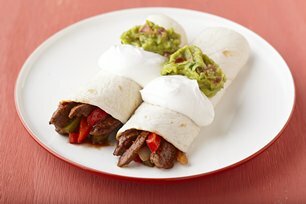 Try our 20-Minute Beef Fajitas with tender steak, an assortment of veggies and all of the fixings. Heat oil in large skillet on medium-high heat. Add meat; cook and stir 3 min. Add vegetables; cook 3 to 4 min. or until meat is done and vegetables are crisp-tender, stirring frequently. Add salsa and barbecue sauce; mix well. Cook on medium-low heat 3 min. or until heated through, stirring occasionally. Spoon meat mixture onto tortillas; roll up. Top with guacamole and sour cream. Select peppers that are brightly coloured, firm, plump and smooth with thick, shiny skins. Ripe, good-quality peppers should be free of spots, cracks or bruises.